The archaeology department at the University of Sheffield have recently teamed up with the Holy Trinity Church at Rothwell in Northampton, England, to conduct analysis on human bones and public outreach at one of only two suspected surviving in-situ medieval charnel houses in the UK (Crangle 2013). The site, a church built in the 13th century AD, houses the skeletal remains of hundreds (quite possibly thousands) of individuals who were stored and lain to rest, after burial, at the site during the middle and late medieval period. It is thought that following the dissolution of the monasteries and reformation in the 1600’s the charnel house fell out of use (Garland et al. 1988: 236). The charnel house and ossuary were supposedly re-discovered accidentally by a gravedigger in the 1700’s, and during the 19th and 20th centuries numerous examinations of the bones were been carried out with the report of the declining environment and effect of fungi on the bones highlighted in Garland’s et al. examination (1988: 240). The University of Sheffield’s new project aims to cover in-depth the osteological and archaeological material at Rothwell with plans for conservation of the site and skeletal material, whilst engaging deeply with public education and interaction, helping to highlight the inherent educational worth of human skeletal remains and their use in human osteology and archaeology (Crangle 2013). Figure 5 (right) and 6 (left) from Garland et al. (1988: 242-243) highlighting the individual skulls lined up on wooden racks and the femora piled up at Rothwell’s ossuary (note the distal area of the femora are visible). Garlands et al. (1988) article discusses the histological and environmental conditions of a selected sample of bones present, indicating that demineralisation was occurring during their storage at the ossuary; although action has now taken place to stop further bone degradation, further conservation is envisaged by the Sheffield project. Further to this the Rothwell church is holding an open day next Saturday (10th of August 2013) where the general public can come and learn about the fascinating site. The open day will include an introductory talk about the project, guided tours around the Holy Trinity crypt, its ossuary and church itself, a hands on sessions of human bone identifying for the general public, alongside a small series of talks from lecturers and students at the University of Sheffield, detailing their research aims and project areas (Crangle 2013). The research on the human bone material will be conducted at the University of Sheffield’s Osteology Lab, a well kitted out setting where plenty of bone experts are on hand for the research and analysis of the bone sample and the historical context of the ossuary remains. 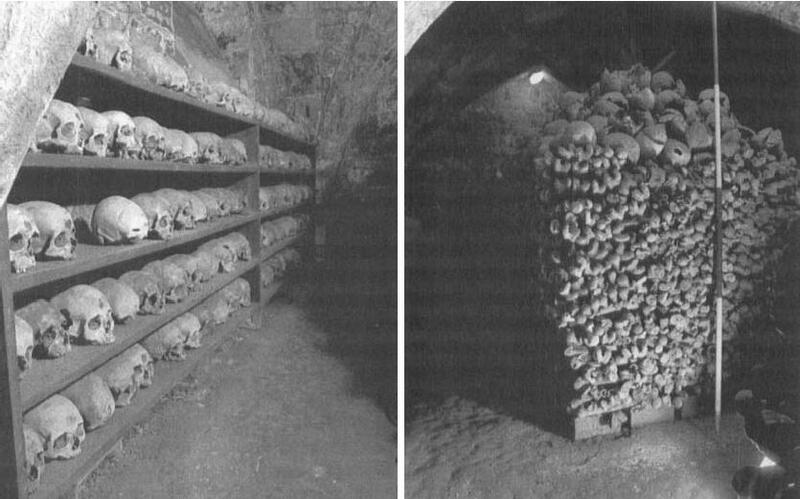 Jennifer Crangle, a PhD candidate at the University of Sheffield, has wrote a fascinating article for the Past Horizons website explaining the importance of the functions and uses of charnel houses and ossuaries during the medieval period in Europe. Especially important is the fact that Crangle (2013) has highlighted each aspect of Rothwell’s Holy Trinity church and the importance of these skeletal remains for the church goers during the medieval period. The article is well worth a read before making your way down to the church itself. Sadly I cannot attend this event, but I would encourage everyone who would be interested to head down and check it out. It is rare that human remains, especially an English in-situ medieval ossuary, are open and on display to the public (unless you happen to live near to some wonderful churches in the Czech Republic and Italy). There are also opportunities to learn about skeletal anatomy first hand. As such, it is a wonderful chance to learn about medieval burial and religious practices with dedicated and knowledgeable staff, whilst also learning about the beauty of the human skeleton first-hand. The open day begins on Saturday 10th August from 11am-4pm for guided tours and activities, with talks are from 6pm-8pm. General public, families, students and academics are more than welcome! Further information and regular updates can be found here on the Rothwell Charnel Chapel and Ossuary Project Facebook site. Crangle, J. 2013. The Rothwell Charnel and Ossuary Project. Past Horizons. Posted 3rd August 2013. Garland, A. N., Janaway, R. C. & Roberts, C. A. 1988. A Study of the Decay Processes of Human Skeletal Remains from the Parish Church of the Holy Trinity, Rothwell, Northamptonshire. Oxford Journal of Archaeology. 7 (2): 235-249.